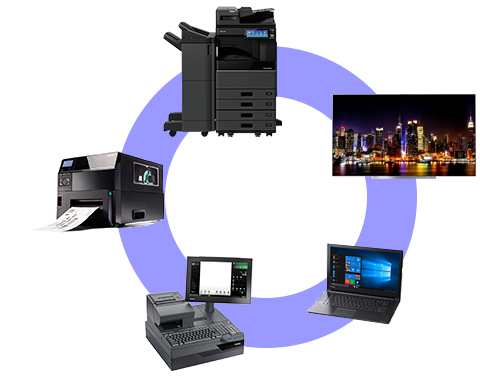 TOSHIBA TEC has been serving customers over many years as both a provider of retail solutions that include POS systems, and as a provider of MFP document solutions that communicate information by incorporating MFP into IT systems in offices and elsewhere. Now we are applying these knowhow to digital signage business solutions, a field that is expanding as a new technique for advertising/sales promotion and information delivery. We propose digital signage systems that are optimized to meet each customer's needs, including transmission of information, entertainment, advertisment and promotion, shop information, restaurant menus, large indoor/outdoor screens, spatial exhibitions, education, and so on. We provide digital signage service optimized to meet each customer's needs with the knowledge of the TOSHIBA TEC's solution. With different levels of customization, we offer everything from content management to design and implementation with our Digital Signage services. Our team will work with your business to help you deliver the right message to the right place and at the right time. It provides sophisticated planning, distribution and management of digital content across a bunch of displays in a network, from simple play loops to frequently changing content. With Virtuoso, we deliver engaging interactive customer experiences using the latest touch-screen technology. 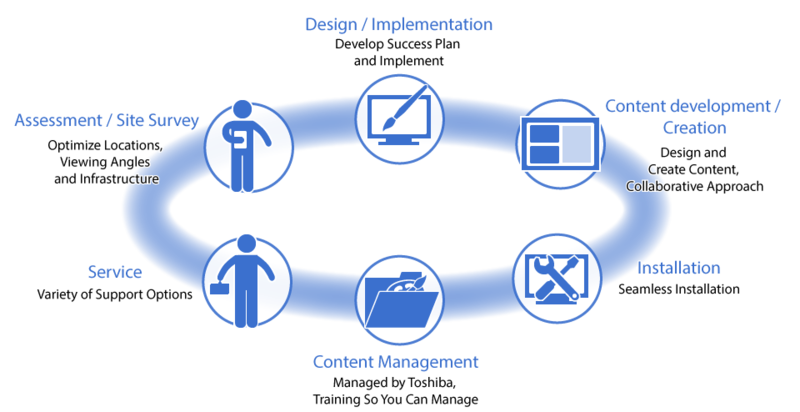 From initial consultation, design to content creation and implementation, our team works with each client to build engaging customer experiences that helps drive sales, educate, inform or entertain, depending on your objectives. A generic term for digital signage solutions Toshiba TEC is servicing in the U.S. and some Europe is called "Elumina." A generic brand name for dynamic distribution digital signage system Toshiba TEC is servicing in the U.S. and some Europe is "Experience Manager." A generic brand name for interactive digital signage system Toshiba TEC is servicing in the U.S. and some Europe is called "Virtuoso." Depend on a country, or region, these generic brand name may be different. If you want to have more information, please contact with your regional sales company or distributor of Toshiba TEC. Depend on a country, or region, these service may not be available. Please contact with your regional sales company or distributor of Toshiba TEC.